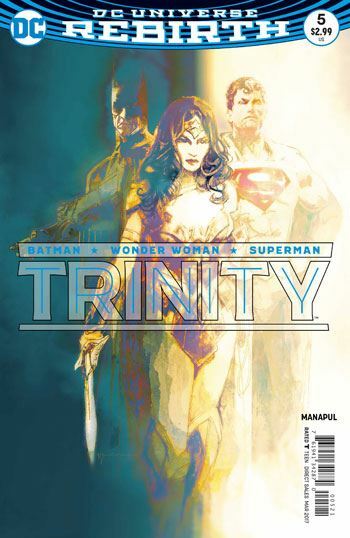 Up to this issue I had been a little on the fence about the Trinity series. While I very much enjoyed each of the first four issues, I was uncertain about where the story was heading, and not entirely sure I would like the path it would take. 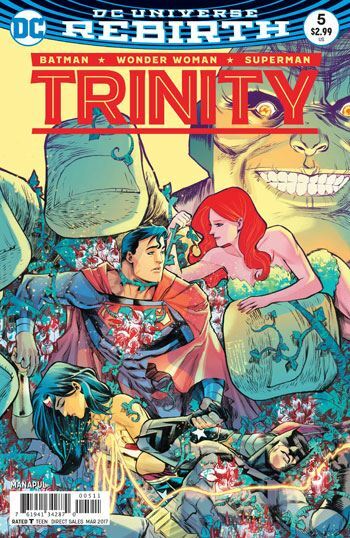 Well, those fears were completely alleviated in Trinity 5. Francis Manapul has a very strong grasp on his tale, and is doing some really clever things with it. At the end of the previous issue Mongul’s involvement was revealed, as well as the fact that Superman, Batman and Wonder Woman had all fallen victim to a Black Mercy. Lois Lane had encountered Poison Ivy, but what part she played in the overall picture seemed murky. In this issue, we find out where Mongul is, what Poison Ivy is up to, why the heroes have been experiencing what they have, and that there is a new kind of Mercy around, a White Mercy. Manapul takes his time unfolding all of this, allowing for some entertaining fight scenes with the heroes, and some weirdly “happy” sequences for Mongul. I particularly like the page in which he envisions himself surrounded by dead Supermen, with a wide variety of incarnations in the pile of corpses. Poison Ivy has received a fair amount of interesting development since the New 52 was launched, with her participation in Birds of Prey, and most recently her own miniseries. This more nuanced view of the character continues in this story, and enjoyably it is Lois Lane, who starts off perceiving her as nothing more than a threat to her child, who comes to see that Ivy has a more compassionate side in this tale. And the reader gets to understand that she is being used as well. All in all an excellent issue, which leaves one eager for the follow up.